I was thinking about buying a mattress online, I needed one, and this seemed like the easiest way to go about it. But one rainy day, I drove by a mattress store and, on a whim, decided to stop in. My experience in the store was fun and I felt confident enough in my selection to buy it right then and there. 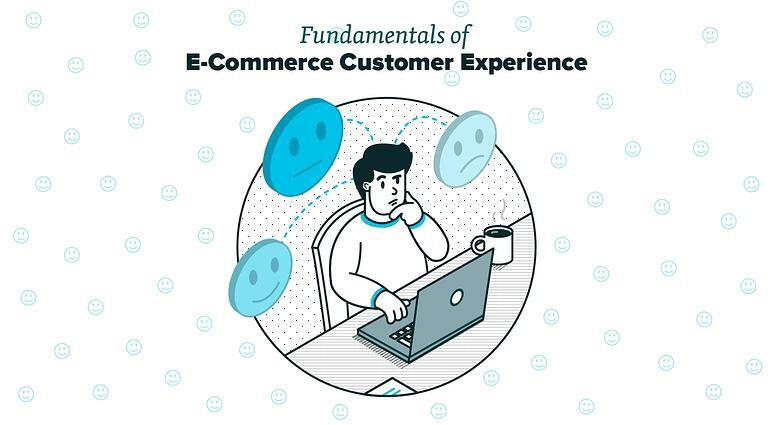 E-commerce still has a long way to go in terms of customer experience (CX). E-commerce is convenient. It’s always on for both the store and the customer. But it’s hard to reach out and engage customers to the same degree a salesperson can in person. Because of this, e-commerce companies need to reach above and beyond to rival the experience of buying in person. This article will cover the fundamentals of e-commerce CX. Before We Get Started, What is CX? CX includes the entire experience a customer has with your brand from start to finish. Advertising, browsing your site, adding to cart, checking out, confirmation and receipt emails, the time it takes to receive the product, unboxing, the actual product itself, the return policy and more. Intuitively, CX is the experience of being your customer. It only makes sense that if a customer enjoys being your customer, they’ll be more likely to continue being your customer. And further, what they say to their friends, family, and network about their experience with your brand can be valuable word-of-mouth advertising. Knowing who your customers are is the first and most important step in providing an exceptional e-commerce CX. To start, you should determine who makes up your target market. Is it men, women, or both? Children, parents, college students, senior citizens? Do they live in urban or rural areas? Are they highly educated skilled workers or blue-collar families? And the list of questions goes on. Getting to know your customers, understanding who they are, what they want, and how to best meet their needs is absolutely essential if you want to actually meet those needs. With this information, you can tailor your e-commerce strategy to delight your customers. Without this information, you’ll have to rely on hunches that may or may not strike a chord with your customers. It might be tempting to throw as wide of net as possible, thinking you’ll get the maximum number of potential customers, but this mindset doesn’t work in practice. Targeted and personalized experiences prove over and over again to win the customer’s appreciation and business. The benefits of knowing who your customers are and what they want are plenty. Having hard data and concrete information means you can make better business decisions on what to stock and how to deliver it. It’ll make your business more efficient. And most of all, your customers will appreciate the tailored treatment. E-Commerce stores have access to recorded customer data to the extent that they are willing to capture it. By capturing, analyzing, and acting on customer behavior data, an e-commerce store can make smart decisions that WOW their customers. UX is similar to CX, both are disciplines that focus on how the customer experiences your brand. But UX is different in that it dives deeper into the technical aspects such as usability, user interface (UI), and workflows. Let’s familiarize ourselves with a few terms relevant to UX. Why Does UX Matter to E-Commerce? For an e-commerce store, UX makes up a large part of CX. Every interaction with your digital store falls within the domain of UX. Only the offline bits like receiving the physical product fall outside of UX. For this reason, it’s imperative to hire talented UX designers, conduct thorough UX research, and emphasize usability in your e-commerce store. You want to make it as easy as possible for customers to go from interest to purchase. Any friction along the way is likely to hurt your conversion rate and revenue. The point here is to eliminate any confusion, provide enough information, make it obvious what the next step is, and make it easy to understand what every option means. A UX strategy puts a goal at the end of your web design. This is where things get fun. Say you want to sell more shoes. You can create a UX strategy to achieve this goal. Your first step would be to start researching how many shoes are sold, what demographics on your site are buying shoes, what shoes are the most popular, what other items are bought when shoes are also purchased, etc. Then you take a look at the paths shoe-buyers take on your e-commerce store. Are they coming into the store and then navigating directly to the shoe category? Are they clicking on product recommendations to navigate to the shoe category? Are your shoppers dropping off when they have to select a shoe size? From this information, you can make some assumptions about how to improve the UX by smoothing out any friction points (like a drop-off point where customers are confused by a complex shoe size chat) and how to optimize the site design to sell more shoes. The next step is to put your ideas into a wireframe to plan for how a user will get from one step to another. High-level wireframes are a great way to test your ideas without investing too much time or effort into web design and web development. This gives you the flexibility to make large changes early on in the process. After the wireframes have been vetted, you can create prototypes or mockups of your design changes. These prototypes look more like the real thing, are used to test your ideas with real users, but don’t require the effort or risk of going live. The next step is user research. It’s ideal to bring in real customers, especially if you have access to a truly representative group of the types of customers you serve. However, this kind of access can be a roadblock for some. If you must, grab the next best thing or even colleagues to test your ideas. Set up your test-subjects with a monitor displaying your prototype. Ask them to complete specific tasks and to explain why they take the actions they do. Be sure to capture first impressions to give you an understanding of what is obvious. After testing your ideas with real users, you’re in a better position to go into development. Sometimes, the results of your UX research will show that your strategy needs more work to achieve your goals. But you won't be starting from scratch, instead, you’ll be armed with more information than you had before. E-commerce CX depends heavily on UX: this is where the majority of your customer’s interactions with your brand will be. UX focuses on pleasing customers but does so with a goal in mind. Use this to your advantage. Inevitably, something will go wrong. When a customer has an issue, you need to be prepared to resolve it in the best possible way. Why? At the point where your customer is ready to walk away, you have a chance to (surprisingly) win their loyalty. According to studies reported on by the American Marketing Association (AMA), when a customer’s expectations are exceeded, their satisfaction and brand loyalty increase. When a customer needs to return an item, learn the technical aspects of their purchase, etc., you have a chance to engage with the customer and win their favor. By making their problem a positive experience, you improve their CX. Customer service is the umbrella term that describes any kind of customer-facing assistance and/or problem-solving. Customer support is a modern term that is closely related to customer service, often used interchangeably with customer service but tends to describe technical assistance. Self-support is used to describe when a customer is able to use existing content or methods to solve problems on their own. Self-support is a big deal in e-commerce. Customers service themselves when they buy a product or service from your website and often expect to be able to resolve issues on their own in the same manner. In addition to meeting (or hopefully exceeding) customer expectations, self-support also eases the labor-demand of your company. Relevant content can live on your site forever and help customers 24/7. It’s easier to write a help guide once than to write that same help guide, open a call line, and have employees available 24/7 to read it over and over again. That isn’t to say that you shouldn’t have live help available! You’ll likely have customers who are more comfortable asking for assistance over the phone rather than reading a guide or watching a video online. However, having a large portion of service requests resolved on their own will lower your expenses and improve CX. There are several channels you can open to be available to your customers. This is called Multi-Channel Support. When all of your support channels are synchronized, this is called Omni-Channel Support. With omni-channel support, your customer interactions are kept organized in the same place. This is helpful for when a customer calls in one day, emails the next, and gives a shout-out on Twitter soon after. When your customer service team is able to see all of these interactions in one place, they can better serve the customer. E-commerce’s advantage in customer service is in its scope. A customer can choose the method they prefer to contact the store. Through omni-channel support customer service representatives should have access to the customer’s entire record of purchases, complaints, etc., to help shape how they handle a situation. Once a customer has purchased from your e-commerce store, it’s time to deliver. Literally. Some e-commerce shops sell digital goods, such as games, software, graphics, movies, music, and online services, and can deliver their product through a website, email, or download. In these cases, UX is the avenue to deliver an exceptional CX. But for most, e-commerce is the means to sell physical goods that need to be physically transported to the customer. This is yet another aspect of CX. If the product isn’t good, the e-commerce experience leading up to it won’t matter. In fact, before you invest in a site to impress your customers, you need to have a product that is perceived to exceed the value your customers pay for it. But this goes without saying. Let’s move on. In survey after survey, shoppers indicate that free shipping makes a big difference in their decision to buy online. This is obviously important for conversion rate, but what about CX? This article began by pointing out the inherent advantages of shopping in a brick and mortar store. One such advantage is that the customer (usually) doesn’t need to consider an additional charge to get their item. There’s a psychological pain associated with paying. We are risk averse creatures and it pains us to know that we are losing our hard-earned money, even if it’s in exchange for good we really need or want. That isn’t to say that it’s a totally negative experience, it’s not. We also enjoy the thrill of having acquired the thing we purchased. The point here is that you should minimize the number of fees and extra charges you tack on an e-commerce purchase if you want to maximize positive feelings in the customer experience. As mentioned, shoppers say time and time again that free shipping is important. On the other end of the scale, one prominent buyer objection is extra charges, or fees added on at the end of a purchase. A shopper looking at a low price can be shocked and discouraged by a suddenly higher price at checkout. Get your free report on top buyer objections by industry here. You can improve your CX and conversion rate by offering free shipping to your customers. But how? Free Shipping on Specific Items – free shipping is applied to move competitive, in-demand, or high margin inventory, etc. Fast shipping can also improve CX, especially in terms of competing with brick and mortar stores. Although it doesn’t rank quite as high as free shipping, fast shipping still makes the list. If it takes a full week to deliver an order, customers may see it as a week-long window to get what they want from a brick and mortar store. According to Internet Retailer, the average delivery time for top retailers is just four days. Amazon has definitely influenced the market by offering free two-day shipping to Prime members. Big box retailers have had to find innovative ways to keep up. One example is Best Buy, which tapped into its physical locations across the United States to store and ship products locally, reducing shipping times. Fast shipping improves CX by reducing the amount of time between the paying online and experiencing the excitement of unboxing a purchase. We put an awful lot of effort into wrapping presents only for the decorative paper and elaborate bows to be torn apart to reveal the gift inside. Objectively, this is a strange tradition. But nonetheless, we love the mystery and excitement of unboxing. So why stop at gifts? Several e-commerce stores, particularly subscription boxes, have distinguished their CX by adding flair to the process of unboxing. Loot Crate, Bark Box, and Blue Apron have even made the excitement of unboxing part of their marketing strategy. 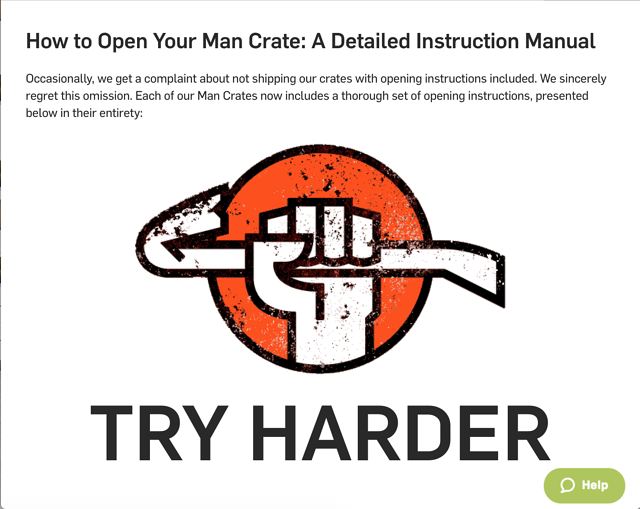 The e-commerce store, Man Crates, has pinned their brand on the experience of unboxing; shipping their products in crates that are intentionally hard to open. We can learn from the success of these relatively young companies that customers value a fun process of opening their e-commerce purchases. A little extra effort here can enhance CX. A good return policy can increase online sales. Why? Because it alleviates the concern that the product may not be what the customer wants. There are quite a few hilarious stories of online shoppers buying products that weren’t what they expected. But at the end of the day, being stuck with a product you didn’t want isn’t funny. When shopping in a brick and mortar store, customers have the opportunity to see, touch, and try products. When I bought my mattress, I was confident that what I purchased was exactly what I wanted. Online, it’s hard to generate that same confidence. 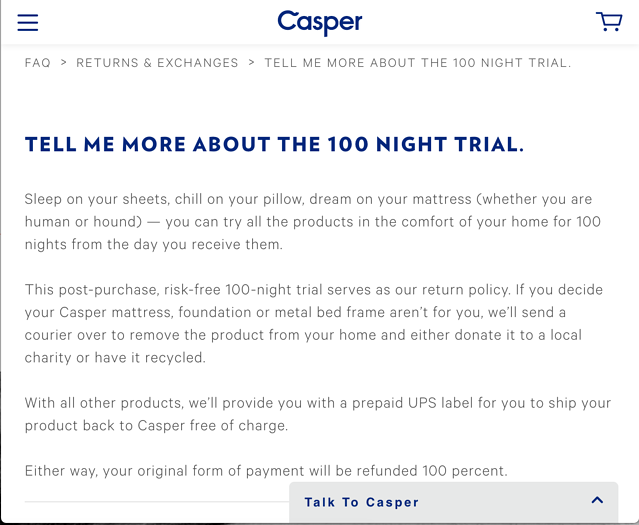 Online mattress store, Casper, tackles this with a 100-night trial. If you aren’t satisfied, they actually send someone to your home to remove the mattress for you. Even when a customer returns a product, they’re still experiencing what it’s like to do business with your brand. This is part of CX and it’s important to make this just as positive of an experience as buying the product in the first place. A good return policy aims to right whatever mistake was made in the transaction with as little hassle to the customer as possible. Do you want to know if you’re making an impact? If so, you’ll need to decide on specific metrics and benchmarks to track your progress. Revenue is always the obvious indicator of success. The problem with using revenue as a metric for success is that it’s hard to isolate what exactly is causing a revenue increase or decline. It could be a viral marketing campaign or market trend that caused an uptick in traffic rather than a new return policy. Even though revenue is sure to be on your radar, make sure that it is not the only metric you watch. Repeat business is a much better testament to CX. It means that the total calculation of product, price, UX, etc., came out positive. Your conversion rate will tell you a lot about your UX. Conversion rate is a measure of how well designed your e-commerce store is for selling and if you are targeting the right customers in the first place. Surveying customer to see how satisfied they are with your e-commerce store, products, and policies is the most direct way to understand how customers are actually experiencing your brand. This article is intended to give you a wide overview of what CX is and how to approach it. The most important step now is to make changes, test your ideas and improve the CX of your e-commerce shop.